coinBR, an established Brazilian crypto-currency company since 2014, has announced it will be launching its multi-services platform, SmartWallet, in South Africa on May 18th 2017. SmartWallet provides users the ability to buy, sell, and pay using Bitcoin and other well-known crypto-currencies such as Zcash, Dash, and Ethereum. Services include paying bills, buying airtime, paying fines, and point-of-sale services for businesses. The online application has been successfully operational in Latin America since 2016, after its initial launch in Sao Paulo, Brazil. SmartWallet is the most recent success for coinBR, which is already a leader on crypto-currency mining. Located in Paraguay, its mining operation is one of the largest in Latin America. Currently the mining operation is run by coinBR's sister company, coinPY. 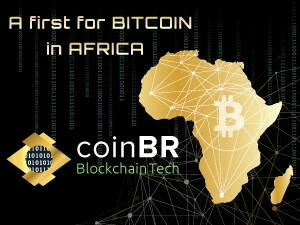 Launching into Africa was the next natural step for coinBR Brazil. "We chose South Africa as our point of entry into Africa," says Rocelo Lopes, CEO of coinBR. "Because we believe it is the economic powerhouse, fintech hub and setting the crypto-currency scene for the rest of Africa. In many African countries, the government currency is unstable with fluctuating rates. Bitcoin offers a security blanket for users wanting more stability and control." coinBR's SmartWallet is the first for Africa because of its user friendly functionality, enhanced security, multi-service/multi-crypto capabilities, and limitless accessibility. "We believe it's essential that even an 80-year old grandmother would be able to use the online application comfortably and safely," says Lopes. "We have a constant, high volume supply of different crypto-currencies, unlike other wallets that might only have a limited daily amount of, just bitcoin, available for purchase," says Carmen Potgieter, Director of coinBR South Africa. "coinBR is in communication with the Reserve Bank to ensure that the full service is available to foreigners who are in possession of a valid South African bank account. This is also a first for South Africa," says Potgieter. "We are also working with the financial institutions and regulators to make the FICA process easier for our clients." "We don't compete with the banking sector," says Potgieter. "We don't want to become a bank and hold your money. We will leave that to the financial institutions to do what they're good at. The intention of Bitcoin was never to take over a country's currency, but to run alongside it. There are things Bitcoin does better than fiat currencies, and that's where we come in." Potgieter adds: "We are also very excited about our partnership with Xapo, an established globally known Bitcoin company. We are currently acting as an agent to facilitate their BTC sales in South Africa. Transactions between SmartWallet clients and Xapo clients will be an off-chain transaction due to our partnership, ensuring an almost immediate transaction time." "When coinBR started investigating the potential to launch in Cape Town, we reached out to the key players in cryptocurrency and fintech," says Potgieter. "Sonya Kuhnel from The Blockchain Academy was instrumental in paving the way as she gathered and educated many of the leading financial minds in South Africa on the opportunities in cryptocurrency, and has created a space for key thinkers to collaborate through annual conferences, making the introduction of coinBR smoother and faster." Kuhnel says: "We believe that we are on the brink of significant developments in the field of cryptocurrency in Africa, and our collaboration with coinBR has the unique potential to change how people access cryptocurrency." "Cryptocurrency meets FinTech at the Bandwidth Barn," says Potgieter. "coinBR has chosen to launch at the Bandwidth Barn, because we feel that the Cape Innovation and Technology Initiative (CiTi) are instrumental in creating an empowering ecosystem where fintech and crypto-currency development can thrive." This ground-breaking event will mark the first step in coinBR's Africa market penetration drive and will take place at The Bandwidth Barn, 66 Albert Road, Woodstock, Cape Town. Attendees of the launch will receive some credit into their coinBR SmartWallet, and can attend a demonstration showing them how to use BTC to pay real-time bills. They will also hear from leading speakers in the field of technology and cryptocurrency. Venue: The Bandwidth Barn, 66 Albert Road, Woodstock, Cape Town.